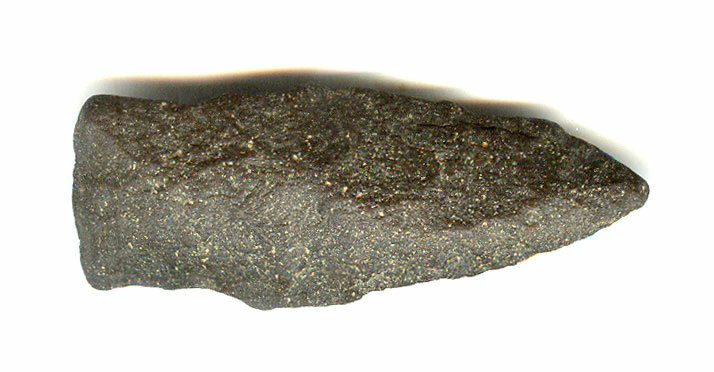 A Small Size, Visibly Aged And Anciently Use Sharpened, Overall Heavily River Polished Scottsbluff II Point That Exhibits Surface Aging And Stone Coloration Patination, Correct Rolled Basal Stem Edge Hafting Dulling, Correct Basal Style And Shape, Correct Material And Manufacture For The Area Found. Found By Charlie Hill, Near The Confluence Of Rock And Holley Creeks, Along With Many Other Similar Points. This Example Is Typical Of Many Small, Scottsbluff II Points Found Near The Town Of Dierks, Arkansas, Often In Groups On Early Sites. This Example Has Heavy Surface River Or Use Polish. Includes A Ken Partain Certificate of Authenticity.